From its foundation in 1927 the St Ives Society of Artists was the dominating exhibition society of St Ives. In 1939 Dame Barbara Hepworth, Ben Nicholson and Naum Gabo moved to St Ives forming the core of what became a strong modern group in the colony. 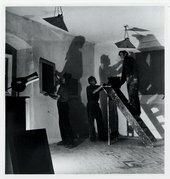 From about 1943 the St Ives Society sought to integrate the modern artists into its exhibitions but in practice their work tended to be hung in the least prominent places in the former church used for the exhibitions. In 1947 the modern artists began to organise separate exhibitions most notably in the crypt of the church itself. They became known as the Crypt Group. There were two shows in 1947 and a third in 1948. The split between modern and more traditional St Ives artists was confirmed later in 1947, when the notoriously reactionary Sir Alfred Munnings was elected President of the Society. However, also in 1948, the members of the Crypt Group became founding members of the Penwith Society of Artists. This finally established a separate identity for the modern artists in St Ives and the Crypt Group had no further reason to exist.